SO. I had a horrifying realisation just now, while scheduling August’s reviews. (Yes, I’m writing this on August 2nd. I’m trying to get my life in order, okay.) 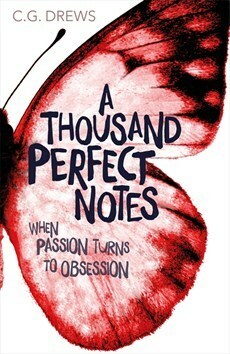 I realised that I never actually posted my review of A Thousand Perfect Notes. Oh, sure, I posted it on Goodreads, but I never posted it here. Despite the fact that I have known Cait since forever, and also really enjoyed the book. How this happened, I have no idea, but I’m pretty sure it has something to do with the book being released on the last day of my exams and me having a huge flare-up of wrist pain that week and so on and so forth. Things happened. Life. Once I realised this, I knew I had to rectify it, but since I already missed the release date by a couple of months (SORRY CAIT), I figured it could wait a couple more weeks so that I could upload a few other reviews in a more timely manner. But still. Whoops. This is my review, mostly verbatim, as it was written back in April Enjoy. I was extremely apprehensive about reading this. I mean — excited! Definitely excited! I requested it without even hesitating when I saw it on NetGalley. But then the pressure kicked in, and I began to get seriously nervous about reading it. I put it off. I kept telling myself I was waiting until nearer the release date. The truth is: when you’ve known someone more than five years (and Facebook said Cait and I became FB friends five years ago in April), and you’ve talked about books and characters until the cows come home, and then their debut gets published… well, I can’t speak for anyone else, but I found it anxiety-inducing. I’ve read some of Cait’s work before, mostly early drafts, but I hadn’t read this one. What if I didn’t like it? What if I had to write a negative or at least middling review of it?! So I put it off. Again, and again. I felt bad, because hey, I had a chance to read it before publication and at this rate I wasn’t going to get there, but I made excuses. I was too busy with uni to have the brainpower to commit to it (not untrue). It doesn’t come out until June, so I should wait (also valid). I knew that when I eventually did read it, I wouldn’t tell Cait I was doing so until I was a decent way through the book, and also that I wouldn’t add it to Goodreads until I was done. It was the only way I could manage it. I might’ve cried on a coach. Quite a lot. When I was only, like, 15% of the way through the book. It wasn’t pretty. Anyway, I had to put the book away because of motion sickness, though I did break my own promise and tell Cait I was reading it and that she’d made me cry. I was planning to read the rest that night, but then I had a terrible day, and then I was too exhausted, so it took until the following evening for me to pick it up again. I told myself I wasn’t going to read the whole thing because (a) I’m meant to be doing uni work and (b) finishing it would mean I was obliged to try and write a review and as previously mentioned, I wasn’t entirely sure I was going to be able to handle that. I finished it and I had no idea how to write a review. It’s good. It’s really freaking good. Like, it’s emotionally good, but it’s also really well-written. I highlighted a million lines just because I liked them. I cried or nearly-cried half a dozen times. Cait somehow made me care about a romance. Not only a romance, but a hetero romance. What. How. I call witchcraft. This hit a bunch of really specific feeling spots for me, some of which I didn’t actually know were there in the first place. If you like sibling relationships you will also cry while reading this book. Beck’s mum is awful and yet … I somehow still felt like I understood her. She wasn’t a one-dimensional villain. And maybe that’s just my own ‘can’t play music anymore so I compensate by channelling that into other stuff’ feelings coming through (although I hope I channel it more positively than she does), but it made the whole thing so much more emotional. I could tell it was Australian, but it’s easily comprehensible and nobody drives a ute. To my great relief. I still remember when I was beta-reading for Cait and had to occasionally ask whether something was a typo or whether that was, in fact, an Australian word. About 80% of the time it was the latter. Even though he’s never mentioned in the book, it made me want to listen to Shostakovich, which is a very specific Musical Angst mood. The afternoon after I sat my final university exam, I went to Waterstones and bought a physical copy of the book. (I also went to Heffers, who didn’t have it, and may have talked them into ordering it.) I have yet to read this copy — I’ve been told that the ARC I read lacked some of the latest edits, and I’m intrigued to know what’s changed, so at some point I’ll do that — but even without those finishing touches… it’s good. ALSO DID I MENTION CAIT IS MY FRIEND AND READS MY DRAFTS FOR ME AND SHE WROTE A REAL BOOK, WHICH IS ON SHELVES, AND WHICH IS ONE OF MY FEW 5* READS FOR THIS YEAR? Okay. We’re cool. Also reading back over this review, I realise it’s completely incoherent and useless as reviews go. WELP. Sorry. Probably not worth waiting five months for me to post it.